Overall, I have an odd day compared to many people. I don’t go to a specific office, nor location, but often to many different locations. I do this so that I can go to the people that I need to meet. I don’t use a car, that would make this style of life a rather unfortunate and morbid business. Not to say I haven’t experienced this lifestyle with a car, I have, and know it’s an unfortunate and morbid business because of that. In great luck and fortune I’ve been able to work my life into living and working this way. It’s a great benefit to myself and also a great benefit to those that I work with. Today I had a number of places to go to throughout the city of Portland. One in the north eastern part of the city, one meeting in the south easy and one in downtown. Each of these meetings was business related, but also personal, for each of the people I’d be going to meet are friends. Again, one more thing to work towards in life, work and live in and around friends. It beats the hell out of working and living around mere acquaintances and enemies. Another key to this day, each meeting was spaced perfectly. I wouldn’t need to hurry between each meeting so I could use a more relaxed and slower form of transportation. I decided it was going to be a transit only day. Usually, when there are a lot of meetings I use the fastest mode for city transportation, the bicycle. Yes, that’s right, and don’t even get me started, the bicycle is easily the fastest way to get around in any urban landscape. The automobile has to be one of the slowest (along with NYC buses). With that key bit of information ascertained I was off. I started the day in north east Portland near Alberta street. Walking down the street on this cool brisk day my first ride was going to be the westward bound #72 Bus. The first meeting just a short 8 minute ride away at Coffee House Five at Albina and Killingsworth. The #72 is a great bus, usually arriving much more often than a freqent service bus (this by Trimet’s definition is every 15 minutes). Usually the #72, as with any non-dedicated right of way running transportation, gets bunched at times. Everything from traffic lights to people crossing the street throw a wrench in the scheduling, so the #72 is sometimes running in clumps of 5, 7 or some short variance between buses. Today was no exception. As I walked to the stop a bus drove by. But as I arrived at the stop another #72 arrived which I boarded. Westward the bus rolled. The short distance was covered in not 8, but 7 minutes. Yes, I timed it because I tend to count everything. I strolled into Coffee House Five. Inside the regular chill crew was slinging the rounds. A cappuccino here and a macchiato there. It’s a consistent shop with a precocious vibe. Something that’s pleasant considering the onslaught of “San Francisco” vibe style coffee shops invading our Portland vibe these days. I enjoyed my cap and a standard boring bagel and cream cheese. After my meeting I walked across the street and waiting two minutes for the arrival of the south bound #4 heading into Portland. The bus pulled up and she and I left for Portland. I pulled out my laptop, as I do, to write this blog entry and other material related to other things. While sitting in the raised rear seat by the back door of the bus a lady joined me. I went on with my typing and into the trip a ways she received a phone call. That phone call was rather interesting, and went something like this. Then she turns to me and asks if Couch is closer to this or the next stop. I tell her the first stop we’re coming to is pretty close by one block. She then decides to get off there. It just strikes me interesting when people make this realization, that there is little reason to drive into downtown Portland and that it is indeed, actually a bad idea. Just go to a park and ride or otherwise and do everybody and yourself a favor, leave the car outside of downtown. The bus went through downtown, turned onto the southern part of the #4 route toward Gresham and left downtown via the Hawthorne Bridge. I looked south toward the new bridge construction for the transit, bike and pedestrian only bridge. It’s a gorgeous structure that will eventually be immensely useful. I can only imagine what the final through count on that bridge will be when the buses, light rail, cycle and pedestrians are rolling across it daily. Onward up Division the bus rolled, I eventually got off near 50th, close to where my next meeting would be and decided I’d hang out at Stumptown for a few. In I went and wrapped this blog entry up… happy transiting all, regardless of your mode; feet, hull, wheel or wing. I joined the BTA finally, after meaning to for years. Met Carl & others at Velo Cult. I needed to meet a fellow coder, cyclist and cool guy Benjamin Van der Veen over there to wrap up some business. I noticed that Velo Cult was having happy hour, he’d mentioned he wanted to check it out, so we setup to meet there at 6:00pm. I rode out Multnomah, cutting around through the bike boulevards toward the Hollywood District where Velo Cult is on 42nd Ave just off of Sandy. I got there just a few minutes early and locked up my bike in the bike corral out front. As I walked in the door I realized that a special guest appearance by retired road racing cyclist Nelson Vails would be in store tonight! Call me stoked, and here’s a little background. • 1980s and 1990s competed professionally in the 6-Day circuits in Europe and the Japanese Keirin events. • Media Cycling commentator involved in cycling commentator for major TV networks and cycling safety programs. • Starred with Kevin Bacon in the Columbia Pictures release of “Quicksilver”, a movie about the tough world of bicycle messengers in New York City. Yup, this guy has ripped it up over the years. He showed a few of his races and gave some commentary about his insight, strategy and approach in each of them. Overall, great to hear about his races from him personally. Benjamin showed up and we snagged a beer, finished the business we had to do and commenced to just hang out. The BTA was taking memberships and since it’d been years that I had intended to join, I figured today was the day. I went over and met Carl handling registrations and got signed up in just a few minutes. 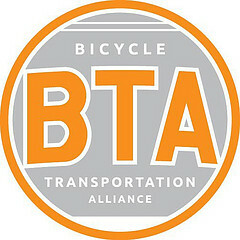 Now I’m a proud member of the Bicycle Transportation Alliance! Walk + Bike to School Network : You know how you hear about police arresting parents for letting their kids ride their bikes to school? You know how in most of America now kids can’t ride their bikes to school, often can’t even bike or walk to school, because it’s just too dangerous. Well, the BTA works diligently to make sure that is never going to happen in Portland! Walk + Bike to Work : Not sure how to bike to your office? The BTA has workshops to help people figure out how to get to work, in one piece, in good fashion, and generally be awesome while doing it! After Velo Cult dinner was had and then a race began. Kristen and I were here, in Hollywood area and home was many blocks away in southeast Portland. We went to wait for the bus at 42nd and Sandy. I of course was going to end up riding and she was going to take the bus, since she was bike-less and I was bus pass-less. The #75 route bus arrived and she boarded. The bus make the green light and I was stuck behind at a red light. I saw it disappear a block away around the corner. The light turned green and I tore through the intersection cranking hard. I dug into the turn that the bus had just gone through seconds before. There was the bus stuck at the next red light. I pulled up behind it. The bus slowly moved forward and I sprung around it to the left as it turned right into the Hollywood Transit Center. I rode up to the 3 story flight of stairs and jumped off my bike, slung it upon my arm and started hoofing it up the steps. The #75 started to pull away behind me to get back on the main road. I got to the top of the steps and rode across the Interstate on the biking & pedestrian overpass, turned hard onto the switchback on the other side. It was entirely empty. I stay safe and don’t want to injure anyone, so go super slow when pedestrians are around or if there is auto traffic. I made it around the switchbacks and into the north south bike boulevard and immediately started cranking hard. I ripped through the neighborhoods in the darkness. I could feel the breeze and dryness of my eyes as the wind whipped around me. Through the ups and downs in the road I swerved in and out keeping a smooth line. I made it to the main arterials; Belmont and then Hawthorne. I then got the Lincoln street bike boulevard and cut down to 39th, where I figured I would see the #75 coming. Sure enough here comes the bus and I have a red at the bike boulevard crossing! Arrgh the bus is going to get ahead of me again! I wait, impatiently, and the bus passes. As soon as the light turns green I rip into 39th, with no traffic I go bold and follow directly behind the bus. I actually catch up and am traveling faster than the bus. I have to brake. Then it actually starts to brake too for the upcoming stop, the stop were Kristen will get off the bus to transfer to the Division #4 route. It stops and I pull up, standing there as if I’d been at the stop for ages. Kristen gets off the bus and gets a little confused as to which direction is which, we figure out we’re going to the stop westward. At first it seems like it’ll be a short distance, but we quickly realize it is closed. We keep walking and get to the next stop. I wait with her for the next bus which pulls up just a few minutes later. I again take off behind the #4 bus (I NEVER like to be anywhere near the front of the bus). After barely a half block I cut off to the left, south to the Clinton Street bike boulevard. I turn onto the clinton street boulevard hard. I can hear my tire gripping the road. There are a few tweaks in the bike, kind of like hearing the bike itself moan under the force of my pushing it into this hard turn. It’s a Surly 4130 cromoly CrossCheck, so I know it’ll hold up though.